The tarp covers the baseball diamond at AT&amp;T Park in San Francisco. 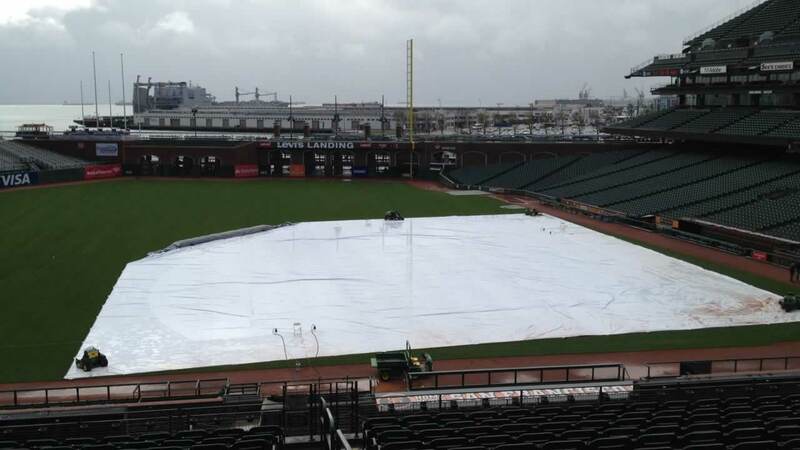 SAN FRANCISCO -- The opener of the Dodgers-Giants weekend series on Friday has been postponed due to rain. The Los Angeles Dodgers were scheduled to play the San Francisco Giants at 7 p.m. -- right in the middle of the downpour. The game has been rescheduled for April 28 at 1:05 p.m.
Saturday's game will be played at 3:05 p.m., which is two hours later than scheduled. No announcements had been made about starting pitchers. Derek Holland (0-1) had been set to oppose Los Angeles right-hander Kenta Maeda (1-0). It's the first rainout at AT&T Park in 12 years and the sixth rainout since the stadium opened in 2000.